Reprogramming of pancreatic exocrine to insulin-producing cells by viral delivery of the genes encoding transcription factors neurogenin-3 (Ngn3), pancreas/duodenum homeobox protein 1 (Pdx1) and MafA is an efficient method for reversing diabetes in murine models. The variables that modulate reprogramming success are currently ill-defined. Here, we assess the impact of glycaemia on in vivo reprogramming in a mouse model of streptozotocin-induced beta cell ablation, using subsequent islet transplantation or insulin pellet implantation for creation of groups with differing levels of glycaemia before viral delivery of transcription factors. We observed that hyperglycaemia significantly impaired reprogramming of exocrine to insulin-producing cells in their quantity, differentiation status and function. With hyperglycaemia, the reprogramming of acinar towards beta cells was less complete. Moreover, inflammatory tissue changes within the exocrine pancreas including macrophage accumulation were found, which may represent the tissue’s response to clear the pancreas from insufficiently reprogrammed cells. Our findings shed light on normoglycaemia as a prerequisite for optimal reprogramming success in a diabetes model, which might be important in other tissue engineering approaches and disease models, potentially facilitating their translational applications. The online version of this article (doi: 10.1007/s00125-015-3838-7) contains peer-reviewed but unedited supplementary material, which is available to authorised users. For type 1 and type 2 diabetes, there is great interest in the generation of new beta cells for replacement therapy. Four approaches have received considerable attention: replication of existing beta cells [1, 2, 3]; neogenesis of new beta cells from precursor cells [4, 5, 6, 7]; embryonic or induced pluripotent stem (iPS) cell differentiation into beta cells [8, 9]; and direct reprogramming of non-beta to beta cells [10, 11, 12, 13, 14, 15, 16, 17]. For the last approach, varying success has been achieved in vivo by administration of transcription factors [12, 13, 14, 17] or cytokines , or the ablation of forkhead box protein O1 (FoxO1) in enteroendocrine progenitor gut cells ; furthermore, evidence exists for the conversion of alpha or delta cells to beta cells after near complete beta cell loss [11, 16]. Reprogramming of acinar to beta cells has been shown to yield insulin+ cells that can persist and function for at least 13 months , which raises questions about potential clinical applications. Among the many environmental factors that could influence reprogramming, glucose is of particular interest because it plays a dominant role in the maintenance of beta cell mass . Beta cell hyperplasia has been linked to glucose metabolism in studies using genetic tools to reduce glucokinase activity [20, 21]. However, chronic hyperglycaemia can exert harmful effects on beta cells leading to a marked loss of glucose-stimulated insulin secretion [22, 23, 24, 25, 26, 27] and changes in gene expression consistent with dedifferentiation or apoptosis [15, 28, 29]. However, nothing is known about the effect of hyperglycaemia on in vivo acinar to beta cell reprogramming. In the present study, we asked whether and how glucose influences in vivo reprogramming of exocrine to insulin+ cells using the three transcription factors neurogenin-3 (NGN3), pancreas/duodenum homeobox protein 1 (PDX1), and MafA. Streptozotocin (STZ)-treated mice were subjected to either islet transplantation or insulin pellet (InsP) implantation to create distinct glycaemic groups before viral delivery of transcription factors . We found that overt hyperglycaemia negatively impacts reprogramming of exocrine to insulin+ cells in terms of their quantity, differentiation status and function. This reprogramming was accompanied by an inflammatory response within the exocrine pancreas with macrophage accumulation. Thus, we found that reprogramming success depends on not only the delivery of transcription factors but also a normoglycaemic environment. Male 6-week-old B6.129S7-Rag1 tm1Mom /J mice (Rag −/−) were obtained from Jackson Laboratories (Bar Harbor, ME, USA). All procedures were approved by the Animal Care and Use Committees of both the Joslin Diabetes Center and Harvard University. Ngn3 (also known as Neurog3)/Pdx1/MafA with the fluorescence marker Cherry on a polycistronic system, or Cherry alone, were cloned into the pad/CMV/V5 adenoviral vector by the gateway system as previously described , and referred to as M3Cherry and Cherry, respectively. A single dose of STZ (Sigma, St Louis, MO, USA), 180 mg/kg freshly dissolved (20 mg/ml) in 1.093 mmol/l citrate buffer (pH 4.5), was injected intraperitoneally into Rag −/− mice after an 8 h daytime fast. After STZ-treatment, groups with differing levels of glycaemia were created using the following protocols. In the hyperglycaemic group, diabetic mice received two insulin pellets (LinShin Canada, Toronto, ON, Canada) by subcutaneous implantation 3–8 days after the STZ-injection. These InsP were sub-therapeutic allowing hyperglycaemia with preservation of reasonable health; additional InsP were implanted upon 10%–20% weight loss. In the normoglycaemic group, islet transplantation (Tx) was employed to achieve normoglycaemia. Islets from adult 6-week-old male C57BL/6J mice were isolated by collagenase digestion  with rodent Liberase RI (Roche, Indianapolis, IN, USA) and purified by gradient separation using Histopaque-1077 (Sigma). Three to eight days after STZ, 6-week-old Rag −/− mice were transplanted with 500 islets under the right kidney capsule . Blood glucose levels were measured on blood from snipped tails with a glucometer (One touch Ultra, Life Scan, Milpitas, CA, USA). Two weeks after the islet Tx or InsP implantation, the pancreatic tail was injected with 100 μl of purified virus at one–two loci (titre 2 × 1010 plaque-forming units/ml) with a 3/10 ml Insulin Syringe (Becton Dickinson, Franklin Lakes, NJ, USA) as previously described . In a subset of mice, the right kidney containing the islet graft was removed 10 or 25 days after virus injection. Thereafter, glucose control fully depended on induced insulin+ cells in the pancreas. Adult mouse pancreases were fixed with 4% paraformaldehyde for 2 h at 4°C. Samples were subsequently incubated in 30% sucrose solution overnight (6–12 h) and embedded with O.C.T. Compound (Tissue-Tek, Torrance, CA, USA). The antibodies used for immunohistochemistry are listed in electronic supplementary material (ESM) Table 1. DAPI was used for nuclear staining. Confocal images of pancreatic sections were taken on a Zeiss LSM710 (Zeiss, Thornwood, NY, USA). To estimate the number of reprogrammed cells, insulin+ cells in every fifth section of the entire infected pancreatic portion were counted by hand and multiplied by the factor 5 using a confocal microscope (Zeiss LSM 710 [Zeiss] at Joslin or a Nikon Eclipse Ti-S [Nikon, Melville, NY, USA] microscope in Cambridge). For quantifications of ratios (e.g. heat shock protein 60 [HSP60]+:Cherry+ cells), we counted cells in four–five independent slides from the infected region of each animal. On day 10 after reprogramming, pancreases were dissociated by perfusion via the bile duct of a Liberase-containing solution (25 mg/ml). Endogenous islets were separated from the exocrine fraction by gradient centrifugation and dithizone staining. The infected exocrine cell fraction was furthered dissociated into single cells by Liberase, dispase and elastase. Cherry+ cells were collected by FACS with FACSaria (BD Bioscience, San Jose, CA, USA). RNA was extracted from the Cherry+ cells. Gene profiling by Illumina microarrays (San Diego, CA, USA) was analysed to assess differential gene expression of cells reprogrammed in hyperglycaemia and normoglycaemia. We used gene set enrichment analysis as well as the Kyoto Encyclopedia of Genes and Genomes (KEGG) pathway database to find significantly enriched gene sets as defined by false discovery rate (FDR) <25% to account for multiple testing. Six-week-old male Rag −/− mice were lethally irradiated using 9 Gy (2 × 4.5 Gy 4 h apart). After 6 h, mice were transplanted by intravenous injection of 107 erythrocyte-depleted (ACK lysis buffer) bone marrow cells extracted from the femur and tibia of 8-week-old Rag −/− or Rag −/−;CD11b-diphtheria toxin receptor (DTR) transgenic mice. Rag −/−;CD11b-DTR mice are B6.FVB-Tg(ITGAM-DTR/EGFP)34Lan/J (Jackson Laboratories) crossed for five generations into Rag−/− mice. Four weeks after bone marrow transplantation, adenovirus injection was performed as above. For macrophage depletion, diphtheria toxin (DT; Sigma) was administered intraperitoneally to all mice at 25 ng/g body weight (in TRIS-buffered saline pH 7.6) on days 0, 2, 4, 6, 8 and 10 after virus injection. PCR was performed on crude infected pancreas (see ESM Table 2 for primers). All animals have been included in data analysis. Data are expressed as mean ± SEM unless otherwise indicated. Mann–Whitney or t tests were used as indicated to estimate statistical significance. Correlations were calculated with the Spearman’s r test. Contingency tables were analysed by χ 2 test. A p value <0.05 was considered statistically significant. To determine if hyperglycaemia has a negative influence on reprogramming, STZ-treated diabetic Rag −/− mice were randomly assigned to a normoglycaemic group by transplantation of 500 islets of C57-mice or a hyperglycaemic group by implantation of InsP to keep animals viable yet hyperglycaemic. M3Cherry or Cherry control viral constructs were injected into the pancreas 2 weeks later, and animals were killed after 10 or 25 days (Fig. 1a). Mice treated with InsP stayed hyperglycaemic (30.5 ± 0.4 mmol/l, n = 18), while transplanted animals were normoglycaemic (9.2 ± 0.3 mmol/l, n = 27; Fig. 1b). Regardless of glucose levels, reprogramming with the M3Cherry viral construct led to the appearance of single or clustered insulin+ cells in the pancreatic tail with minimal numbers of Cherry+ cells stained for glucagon, somatostatin or pancreatic polypeptide (Fig. 1c, ESM Fig. 1a–c). On day 10, recipients of islet transplants had 141 ± 22 × 103 insulin+ cells, while InsP recipients had 84 ± 20 × 103 (both n = 5; p = 0.2, Fig. 1d, ESM Fig. 2a). The number of reprogrammed insulin+ cells in normoglycaemic animals increased from day 10 to 25 (233 ± 25 × 103, n = 4) in contrast to the hyperglycaemic group with an unchanged number of reprogrammed cells (79 ± 10 × 103, n = 5, Fig. 1d). Thus, the estimated total number of reprogrammed insulin+ cells differed significantly in hyperglycaemic and normoglycaemic animals on day 25 (p < 0.05, Fig. 1d). For individual animals at each time point (day 10 and 25), there was an inverse correlation between mean glucose levels after reprogramming and the number of reprogrammed insulin+ cells (day 10: r = −0.75, p = 0.003 [n = 13]; day 25: r = −0.94, p = 0.02 [n = 6], ESM Fig. 2b,c). This inverse correlation even existed in normoglycaemic mice receiving mouse or rat islets, the latter having lower glucose levels due to rat beta cells having lower glucose set-points for secretion (insert ESM Fig. 2b). We assessed the temporal sequence of reprogramming events. Cell size reduction has been described as an early morphological response to iPS cell and exocrine to beta cell reprogramming [17, 33]. Moreover, we have previously shown that acinar to beta cell reprogramming follows a temporal sequence with acinar cells adopting first an endocrine and then beta cell fate . Thus, reprogramming events were followed over time: (1) initiation of reprogramming as assessed by cell size reduction; (2) endocrine commitment by chromogranin A (ChgA) expression; and (3) beta cell commitment by insulin expression. Maximal diameters of Cherry+ cells were determined in M3Cherry-injected animals and Cherry-injected controls. In both hyperglycaemic (hyper) and normoglycaemic (normo) conditions, cell sizes of Cherry+insulin+ (hyper 18.1 ± 0.5 μm, normo 18.3 ± 0.4 μm) as well as Cherry+insulin− (hyper 17.5 ± 0.6 μm, normo 18.3 ± 0.4 μm) cells were significantly smaller in M3Cherry-treated animals compared with Cherry+ cells in Cherry-injected controls (hyper 27.7 ± 0.4 μm, normo 28.7 ± 0.2 μm, all comparisons p < 0.05, Fig. 2a), indicating preserved reprogramming initiation by cell size reduction, irrespective of glucose levels. The endocrine commitment as assessed by ChgA expression was 91.2 ± 2.3% of Cherry+ cells in hyperglycaemic mice on day 10, while virtually all Cherry+ cells co-expressed ChgA in normoglycaemic animals (99.0 ± 0.4%, p = 0.008; Fig. 2b), suggesting impaired endocrine commitment with hyperglycaemia. This difference in ChgA expression was also seen on a qualitative level, as ChgA expression in hyperglycaemic animals was much weaker and more inhomogeneous compared with its strong and even expression in normoglycaemia. Beta cell commitment was assessed by the proportion of infected Cherry+ cells stained for insulin. On day 10, the percentage of insulin+/Cherry+ cells was significantly lower in hyperglycaemic (37.2 ± 4.9%, n = 5) compared with normoglycaemic mice (57.3 ± 5.8%, n = 5; Fig. 2c). While by day 25 in hyperglycaemia the percentage of insulin+/Cherry+ cells only increased to 57.0 ± 4.5% (n = 5), with normoglycaemia reprogrammed cells exhibited a reprogramming efficiency of 79.0 ± 6.0% insulin+/Cherry+ cells (n = 3), indicating increasing commitment toward the beta cell lineage (Fig. 2c). This went along with significantly lower expression of NKX2.2 (NK2 homeobox 2) protein in reprogrammed cells of hyperglycaemic animals (72.2 ± 5.8%, n = 3) compared with normoglycaemic animals (87.3 ± 3.3%, n = 3, p < 0.05, t test). Taking these findings together, hyperglycaemia does not affect reprogramming initiation as reprogrammed cells still undergo cell size reduction, yet inhibits the endocrine and beta cell commitment later in this temporal sequence. When M3Cherry viral constructs were injected into hyperglycaemic animals that had received InsP-implants, sustained normalisation of glucose levels was not achieved (not shown). To determine at what stage hyperglycaemia affects the function of reprogrammed cells, nephrectomies (Nx) of the kidneys carrying the islet grafts were performed early (day 10) or late (day 25) after reprogramming. After Nx, glycaemia fully depended on reprogrammed cells as endogenous beta cells had previously been ablated by STZ (Fig. 3a). Hyperglycaemia defined as glucose >11.1 mmol/l in the 2 weeks following Nx occurred in 5/6 animals in the early Nx group while 1/6 animal was hypoglycaemic as opposed to 2/7 hyperglycaemic, 3/7 normoglycaemic and 2/7 hypoglycaemic animals in the late Nx group. Glucose levels at 1 week after Nx were 21.7 ± 3.9 mmol/l in the early Nx group (n = 6), which was significantly higher than the levels of 7.9 ± 1.8 mmol/l (n = 7) in the late Nx group (Fig. 3b, c). Thus, hyperglycaemia during reprogramming results also in functional impairment of insulin+ cells, while their function is maintained in a normoglycaemic environment. With hyperglycaemia and the M3Cherry injection, major tissue remodelling in the exocrine cell compartment was evident on day 10, with formation of abundant tubular complexes reminiscent of those seen in pancreatitis . Insulin+ cells were found contained within these tubular structures (Fig. 4a, b, ESM Fig. 3). Cells of tubular complexes strongly expressed the mitochondrial stress marker HSP60 in hyperglycaemic animals (ratio of HSP60+:Cherry+ cells 3.6 ± 0.5, n = 5). Such tubular complexes were not found in normoglycaemic M3Cherry-injected animals at this time point (ratio of HSP60+:Cherry+ cells 1.2 ± 0.1, n = 5; Fig. 4a, ESM Fig. 3), and by day 25 they were no longer predominant in either group (ratio HSP60+:Cherry+ cells 1.0 ± 0.01 [hyper, n = 3] and 1.1 ± 0.05 [normo, n = 3]; Fig. 4a). panCK(pan-cytokeratin), a marker of pancreatic duct epithelial cells, was found to be strongly expressed in the tubular complexes of hyperglycaemic M3Cherry-injected animals on day 10 (ratio panCK+:Cherry+ cells 3.9 ± 0.6 [hyper, n = 5] vs 0.6 ± 0.08 [normo, n = 5]), while this differential was gone by day 25 (ratio panCK+:Cherry+ cells 1.0 ± 0.2 [hyper, n = 4] vs 0.4 ± 0.02 [normo, n = 4]; Fig. 4b, ESM Fig. 3). As with HSP60 expression, panCK+ tubular complexes were not found in hyperglycaemic Cherry-injected controls and noninfected areas of M3Cherry-injected animals (not shown). With normoglycaemia, the majority of reprogrammed cells were found in clusters potentially representing former exocrine acini. This arrangement was less pronounced with hyperglycaemia, consistent with disrupted pancreatic architecture (Fig. 2c). Together, these findings support the notion that hyperglycaemia prolongs the time of inflammatory exocrine tissue remodelling. Rapid downregulation of the exocrine gene programme is known to precede adoption of an insulin+ phenotype . Thus, impaired reprogramming in hyperglycaemia might be due to a failure of acinar cells to efficiently downregulate their exocrine cell programme. Indeed, we found higher expression of PTF1A (pancreas specific transcription factor, 1a) protein (Fig. 4c) in reprogrammed cells of hyperglycaemic (20.4 ± 5.3%, n = 3 insert) relative to that in normoglycaemic animals by day 10 (9.3 ± 2.8%, n = 3, p < 0.05, t test). These findings provide additional information about the adverse effects of hyperglycaemia on reprogramming. Microarray analyses were performed on Cherry+ cells harvested 7 days after reprogramming. Strikingly, differences in gene expression predominantly concerned inflammatory markers, which were more prominent in the hyperglycaemic condition. By gene set enrichment analysis, we found 25 enriched gene sets in hyperglycaemia defined by an FDR <25% to account for multiple testing, 13 of which were directly connected with inflammation or apoptosis (Table 1). Therefore, we examined the involvement of immune cells in the reprogramming failure of hyperglycaemic animals. As Rag −/− mice do not harbour mature B and T lymphocytes, we focused on the role of macrophages. Immunohistochemistry revealed increased numbers of macrophages as assessed by F4/80 staining in areas of reprogramming in hyperglycaemic compared with normoglycaemic M3Cherry-injected animals on day 10 (F4/80+ cells/mm2: 1,501 ± 263 [hyper, n = 5] vs 625 ± 65 [normo, n = 4]; Fig. 5a). On day 25, however, the number of macrophages had declined in both glycaemic conditions (F4/80+ cells/mm2: 562 ± 158 [hyper, n = 4] vs 268 ± 23 [normo, n = 4]; Fig. 5a), demonstrating the transient nature of the inflammatory response. Macrophages were sparse in hyperglycaemic Cherry-injected controls and in uninfected areas of M3Cherry-injected animals (uninfected areas F4/80+ cells/mm2: 69 ± 15 [hyper, n = 5] vs 77 ± 15 [normo, n = 4] day 10; 30 ± 8 [hyper, n = 5] vs 30 ± 5 [normo, n = 4] day 25). Double-staining for tubular complexes and macrophages revealed their spatial relationship with macrophages adjacent to the tubular structures (ESM Fig. 4). If macrophages were directly deleterious to reprogramming success, reducing their number during or after viral delivery of transcription factors could give rise to more reprogrammed cells. We established a model of macrophage depletion by whole body irradiation, followed by bone marrow Tx of CD11b-DTR or wild-type (WT) donors and DT injections for 10 days to ablate CD11b-DTR cells (Fig. 5b). The 10 day time point was analysed for macrophage infiltration and reprogramming efficiency. As expected, WT transplanted mice had significantly higher macrophage infiltration (macrophages/mm2 640 ± 120 [SD], n = 4) compared with CD11b-DTR transplanted mice treated with DT (macrophages/mm2 333 ± 71 [SD], n = 4; Fig. 5c). mRNA isolated from infected pancreas confirmed reduced presence of macrophages by lower Emr1 (also known as Adgre1) expression (the gene product encoding F4/80 antigen) in CD11b-DTR transplanted mice, whereas adenoviral M3Cherry was expressed at similar levels (Fig. 5c). We also found strong mRNA downregulation (>20-fold) of the M2-macrophage polarisation marker Retnla (encoding resistin like alpha) in CD11b-DTR transplanted mice, concomitant with a sevenfold upregulation of Tnfα in the same tissue (ESM Fig 5). This finding indicates that primarily M2-polarised macrophages were depleted, and that their eradication exacerbated the inflammatory milieu. Confirming efficient monocyte/ macrophage depletion, the relative percentage of CD11b+/Gr1−/low monocyte relative to CD11b+/Gr1high granulocytes was significantly lower in the peripheral blood in macrophage-ablated animals (ESM Fig. 5). However, macrophage-depleted animals did not display increased reprogramming efficiency compared with controls (insulin+/Cherry+ cells, CD11b-DTR: 69 ± 5% [SD], WT: 84 ± 5% [SD]; Fig. 5c). We conclude that at least under normoglycaemia, macrophages are not directly detrimental to reprogramming and might even engage in dampening tissue inflammation. To better understand the role of macrophages, we assessed their spatial relationship with reprogrammed cells and found that on day 25 a substantial number of macrophages had engulfed Cherry+insulin− cells, which was most pronounced in the hyperglycaemic group (macrophages with Cherry+insulin− 36.2 ± 5.1% [hyper, n = 4] vs 19.7 ± 4.8% [normo, n = 4]; insert Fig. 5d). The numbers of engulfed Cherry+insulin+ cells in macrophages were generally lower (Fig. 5d). TUNEL staining to assess whether reprogrammed cells had undergone apoptosis prior to engulfment by macrophages showed that occurrence of apoptotic Cherry+ cells was rare in both hyperglycaemic and normoglycaemic conditions, yet slightly higher in hyperglycaemic animals on day 10 (p = 0.03; not shown). Thus, low apoptosis rate and at the same time high numbers of engulfed Cherry+ cells in macrophages suggests that either apoptosis is not a prerequisite for macrophage engulfment or that apoptosis is difficult to capture. Thus, in the presence of hyperglycaemia it appears that a high number of macrophages are recruited by day 10 due to the presence of incompletely reprogrammed cells, some of which are found to be engulfed by the macrophages at day 25. In this study, we found that hyperglycaemia negatively affects in vivo exocrine to insulin+ cell reprogramming in terms of their number, differentiation and function. Studies performed in a normoglycaemic environment yielded more than twice as many reprogrammed cells compared with hyperglycaemia. Our results stand in contrast with other studies, which have indicated that hyperglycaemia promotes reprogramming of non-beta to beta cells in a cytokine-treatment model  and a partial duct ligation (PDL) model . Our PDL studies, however, failed to produce a similar facilitating result . The mechanisms for these differing observations require further studies. When Cherry+ cells were evaluated 10 days after injection of the M3Cherry virus, they had a considerably smaller diameter (about 30%) than those injected with the control virus. This result can be taken as evidence for a change in cell phenotype towards a smaller cell such as a beta cell because acinar cells are larger than beta cells. Of note, the reduction in cell size was essentially the same for both the normoglycaemic and hyperglycaemic conditions, which suggests that initiation of the reprogramming cascade is taking place notwithstanding hyperglycaemia. However, size reduction of reprogrammed cells does not presume stabilisation towards a fully reprogrammed phenotype . The effects of hyperglycaemia became more evident when endocrine and beta cell commitment were evaluated, respectively. With normoglycaemia, virtually all Cherry+ cells expressed ChgA, as an indicator for their endocrine differentiation, while in the hyperglycaemic state about 10% of the Cherry+ cell were ChgA-negative. Hyperglycaemia was also associated with a reduction of cells stained for both insulin and Cherry. Additional evidence for the adverse effects of hyperglycaemia was that Cherry+ cells lacked prompt downregulation of the acinar marker PTF1A in hyperglycaemia compared with normoglycaemia. Our earlier study using this reprogramming model found that downregulation of acinar factors preceded adoption of an endocrine and beta cell phenotype . Our estimation of the total number of Cherry+ cells suggests that they are similar in normoglycaemic and hyperglycaemic conditions (normo 263.5 ± 60 × 103, hyper 222.7 ± 46 × 103, both n = 5, p = 0.4). Differential adenoviral infection therefore is unlikely to account for our observations. The impaired differentiation towards the beta cell lineage was also reflected by reduced function, which was seen when reprogrammed cells were challenged with hyperglycaemia produced by graft removal early (10 days), as opposed to later (25 day) removal after reprogramming. We found that in the normoglycaemic state the number of induced cells increased between days 10 and 25; therefore, we postulate that the number of induced cells by day 10 is only marginally sufficient to sustain normoglycaemia. 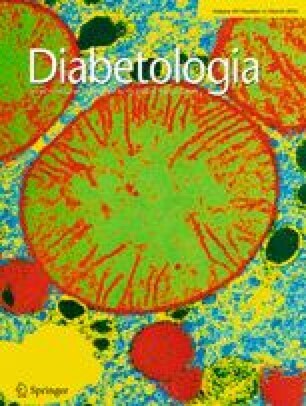 Major phenotypic changes of the acinar cell compartment consisting of tubular complexes at the site of injection in the pancreatic tail were found at day 10 after M3Cherry injection in the presence of hyperglycaemia but not with normoglycaemia. Transient tubular complex formation has been described with pancreatic duct ligation  and cerulein-induced pancreatitis  and is thought to originate from acinar cells , while beta cells have been excluded as their source of origin . However, the recovery of normal exocrine morphology is rapid (within 7 days) in cerulein-induced pancreatitis . It is possible that hyperglycaemia prolongs the inflammatory changes of the exocrine pancreas elicited by the M3Cherry injection. In support of this theory, hyperglycaemia has been linked to impaired exocrine regeneration [40, 41] and impaired wound healing . We found high expression of HSP60 in tubular complexes. HSP60 is a mitochondrial chaperone that promotes refolding of redox-modified proteins  and has been shown to be induced in response to hyperglycaemia and oxidative stress in vitro (human HeLa  and INSE1 cells ). Microarray analyses of Cherry+ cells obtained from hyperglycaemic animals revealed a strong inflammatory and apoptotic pattern. Macrophages were abundant in areas of reprogramming in hyperglycaemic animals, located next to tubular complexes. The close spatial and temporal relationship between tubules and macrophages suggests a mutual interaction; perhaps secretion of biologically active factors by macrophages leads to tubular complex formation as has been postulated . Mechanistically, the macrophage-secreted proinflammatory cytokines TNF and RANTES (regulated on activation, normal T cell expressed and secreted) have been identified to activate the nuclear factor (NF)-Kb pathway in acinar cells and by induction of its target gene MMP-9 leading to tubular complex formation . If macrophages were directly deleterious to reprogramming success, reducing their number during or after viral delivery of transcription factors might have given rise to more reprogrammed cells. Thus, macrophage depletion was performed in normoglycaemic mice using CD11b-DTR. Bone marrow Tx was necessary as DT treatment of nontransplanted Rag;CD11b-DTR mice caused severe toxicity. For animal welfare reasons, such a depletion experiment could only be performed in normoglycaemic animals. The monocyte/macrophage lineage was consistently depleted by approximately 50%. We found that reduction of macrophages to this degree did not increase reprogramming efficiency. However, the only partial depletion of macrophages in our model could obscure some of their functions in reprogramming. Given that we mainly depleted M2-polarised, alternatively activated macrophages, with increased total levels of the proinflammatory cytokine TNFα, this indicates that early macrophage infiltration might serve a role in curbing inflammation. Another reason for the expanded macrophage presence in hyperglycaemic animals could also be due to increased phagocytic demand to clear the pancreas of only partially reprogrammed cells, which might be abnormal, dying or dead. Accordingly, Cherry+insulin− cells were found to be engulfed by macrophages, most prominently with hyperglycaemia on day 25. In summary, our studies found that hyperglycaemia impairs in vivo reprogramming of exocrine to insulin+ cells. Our model proposes that hyperglycaemia causes less efficient cell reprogramming, which leads to less efficient secretory function and even cell death. In the normoglycaemic state, there must also be production of some defective cells that are cleared by macrophages, but the situation with hyperglycaemia seems much worse. The suggested sequence of events in reprogramming with hyperglycaemia is as follows: (1) less downregulation of acinar factors and less activation of the beta cell programme resulting in poorly differentiated cells that are vulnerable and dysfunctional; (2) the presence of such partially reprogrammed defective cells, probably leading to more macrophage infiltration into areas of reprogramming; and (3) remodelling of the exocrine tissue with tubular complex formation, most probably through cytokine secretion of macrophages. Macrophages may also play an important role in the clearance of damaged and dead cells. Gaining in-depth knowledge about factors influencing reprogramming success is important for a comprehensive understanding of reprogramming mechanisms and their potential for future clinical application. We thank J. Hollister-Lock (Joslin Diabetes Center, Harvard University, Boston, MA) and J. Brown (Department of Stem Cell and Regenerative Biology, Harvard University, Cambridge, MA) for technical assistance, B. Saez (Massachusetts General Hospital, Boston, MA, USA) for support for the bone marrow transplantation experiment and Boston Children’s Hospital core facility for an Illumina array. CCW, WL, AZ, TY, JL, AJ, YMB, GCW and QZ provided substantial contributions to experimental design. CCW, WL, AZ, MSA, YZ, TY, MW, JL, AJ and YMB provided substantial contributions to experimental execution. CCW, WL, AZ, MSA, YZ, MW, SBW, GCW and QZ carried out data analyses. CCW, WL, AZ, MSA, YZ, TY, MW, JL, AJ, YMB, SBW, GCW and QZ were involved in figure preparation, manuscript writing and editing. CCW, WL, AZ, MSA, YZ, TY, MW, JL, AJ, YMB, SBW, GCW and QZ approved the version to be published. QZ is the guarantor of this work. This study was supported by grants from the JDRF and the Hahnemann Hospital Foundation (GCW), and the National Institutes of Health NIH R01 DK 066056 and DK 093909 (SBW), P30 DK036836 (Joslin Diabetes Research Center and its Advanced Microscopy Core), as well as the Diabetes Research and Wellness Foundation. CCW and AZ are supported by postdoctoral fellowships from the Swiss Science Foundation and the Swiss Foundation for Grants in Biology and Medicine. WL is supported by a postdoctoral fellowship from the Juvenile Diabetes Research Foundation. QZ is supported by grants from The National Institute of Diabetes and Digestive and Kidney Diseases (NIDDK) and Harvard Stem Cell Institute (HSCI).